In this page you will be taken on a interesting tour of some of Sheffield's Historic Homes. They were all built before the Civil War. The homes are private residences and are not open to the public. William H. Root had this impressive Greek Revival home above, built in 1847, along the lake front. The most noticable details are the enframements around the front entrance. On the east side of the house is an interesting door. It is called the funneral door, so named because, they would have the visitation in the parlor. The casket would be carried in through this door, and that is the only time this door would be used. The last time it was used was in 1949. Orville, Willaim's oldest son, lived here until his death in 1919. Orville had a ticket for the RMS Titanic, but it was for the return trip from New York to Southhampton. Some couny maps show Root Road as Orville Root Road. Then Harriet, Orville's daughter occupied the home until she passed away in 1975. In 1976 Mr, and Mrs Ben Norton bought it, and started restoring the home. 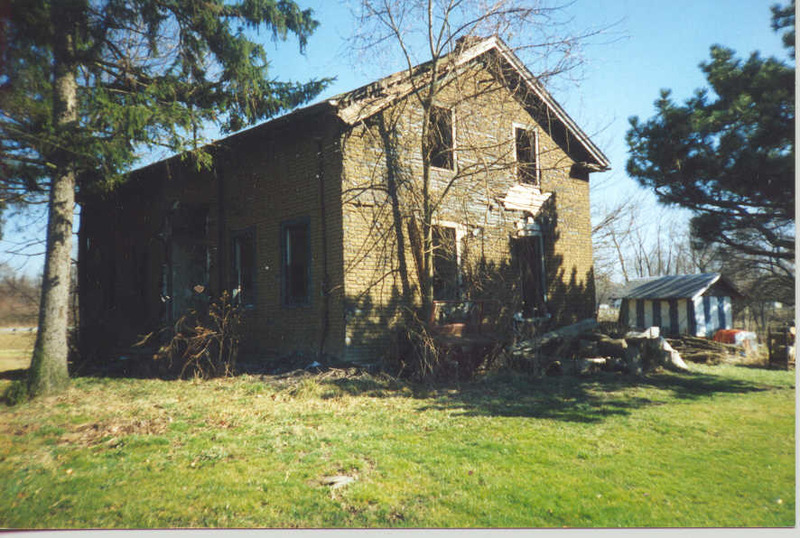 In this photo of the house, it is stripped of paint. After 150 years new paint would not stick, and a careful chemical bath was done. A fresh coat of white paint is now on, and the completed restoration can be viewed. The Root house is located at 3535 East Erie Avenue in Lorain. Capt. Arron, William's brother lived on the family farm. It was located at the southwest side of the intersection of Rt611(Colorado Ave) and Rt301(Abbe Rd). The house was built between 1830 to 1840, and was a Greek Revival style home. Ezra Jackson of Avon may have designed it. Not much of the woodwork remains now. Captain Root was well-known, and was involved with the Underground Railroad. He sailed the runaways from the Burrell Homestead, to freedom across Lake Erie. His warehouses was along the Black River in Charleston, now known as Lorain. After his death in 1865, the land was sold. He is buried in the Garfield Cemetary on Detriot Road. Several people owned the land, since 1870. in the 1930's the Dowacky family lived here. Then the Klingshrin's lived here until, they built thier new home on the lot west of the house. The Klingshrin's own a gift shop called Sandy's Red Barn. The Root land is owned by Forest City Development Co. of Cleveland. The house became rundown during this time. With the right owner the house could be restored to its past beauty.